3D Vision fix for Devil May Cry HD Collection. With several graphics options and texture packs. Update (2018-04-05): fixed a problem in "d3dx.ini" that made SBS/TAB modes not work. I suggest redownloading the fix even if you don't use this. - Smoke, lights, blood, special effects... just about everything that isn't normal geometry is now in correct 3D space. - Some haloing issues (approximate fix). - Download this file and extract its contents in the "Devil May Cry HD Collection" folder, where "dmc1.exe", "dmc2.exe" and "dmc3.exe" are. If Devil May Cry 3 fails to start with 3D Vision enabled, try forcing 120Hz with Special K (under the "[Render.FrameRate]" section, set "RefreshRate=120"). And make sure the game resolution matches your desktop resolution. - DMC1 varies depending on the room. It has multiple presets. 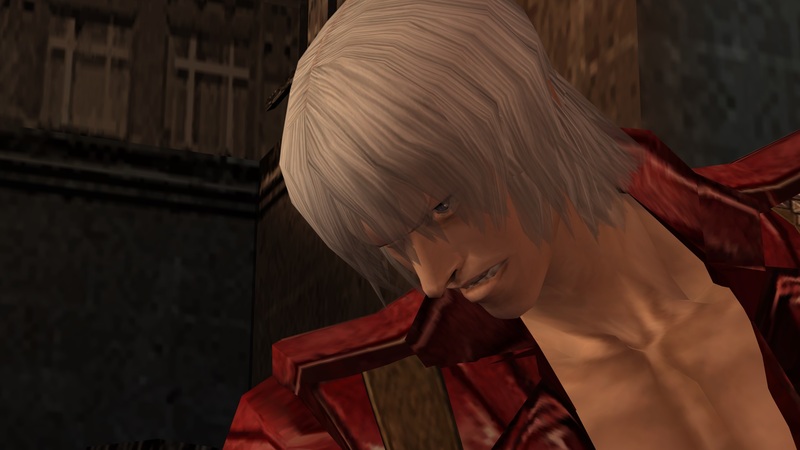 - DMC2 needs the default preset for gameplay and only another one for cutscenes. Pressing the hotkey will only switch between these two. - Very high resolution artworks for DMC2 and DMC3 (especially DMC3). In DMC2, it's only Dante's and Lucia's outfit selection screen (the outfit images). In DMC3, it's the title screen (game title only for Japanese logo), load/save screen, options, Vergil's first costume screen, total results, bloody palace, and one Lady artwork that I don't know where you can see it. - Very high resolution moon textures, trying to be close to the original ones. Three of them react to the sky bloom hotkey, apart from their original counterparts. - Hair and typo fixes. This adds back transparency for Dante's hair in cutscenes and gameplay. There is one typo fix for Spanish where it previously said "Manniobras" and now it correctly says "Maniobras" (Vergil menu). I recommend using this pack (I recommend all of them, but this one especially because it fixes a game issue). Keep in mind that for the artworks and moon I went for maximum quality and resolution no matter what. They are very big lossless textures (A8R8G8B dds files with mipmaps included) except for the DMC2 ones (lossless format didn't work for this one, so I used DXT5). Feel free to resize or compress them, in case I don't do it in the future. Using CompactGUI you will recover more or less 2/3 of the total space. If you have questions about Special K, check the Steam discussion. I have tested these texture packs using Special K in the local way. That is, using the 64 bit dll as "dxgi.dll". If you play in 3D, make sure you don't enable the option to generate mipmaps. It will break the 3D elements I fixed. Most of the texture packs (which I'll keep updating) discussion will probably happen here. Heatwave effects and door transition effects are super stretched when you play at this resolution, making the game impossible to play in some missions. It's a game bug not related to 3D. To fix it, open "d3dx.ini" and search the "y7=1" line, and then change it to "y7=5", or change it to "y7=0" to disable the effect. - F1: convergence presets. Each game may need different convergence. - F4: black bars toggle. No issues other than that it disables fade to black and fade from black transitions. I recommend using this. - F5: sky bloom presets for DMC1 (daytime sky) and moon bloom for DMC3. - F6 or XB_LEFT_THUMB: shadows and objects fix preset for DMC1 and DMC2. Explained in the "Extra instructions for Devil May Cry 1 and 2" section. - 1: depth of field toggle for DMC3, normally used in cutscenes. - 2: bloom toggle for DMC3. It sometimes needs the "1" hotkey when you disable this or else it will look red. It makes real shadows fainter. - 3: ghosting toggle for DMC3. In very rare occasions (one of the last missions) you will need some of the other two hotkeys to not see red color if you disable this. Sorry about that. It was a mistake of mine in "d3dx.ini". Redownload the fix and enable the SBS/TAB shader again. It should work now. This means that my Tekken 7 fix has this broken too. I'll have to update that fix. First off thanks a tonne to helifax, mike, DHR, DJ, darkstarsword, Masterotaku, bo3b, neovad and all the unsung heroes of the 3DVision community who have kept the dreams of a 3d gamer like us still alive. You guys are ones who are filling the pockets of guys at nvidia at the cost of your own. That's because its ur wonderful fixes that keep us buying the hardware meant for 3dgaming from the leeches at Nvidia who have completely taken off their eyes from 3d gaming now and still somehow earning money by selling 3DVision kits, 3dtvplay software and what not. Am just an another gamer amongst many who buys games only after checking helixmod blogspot for their fix. Thats true!!! You guys rock! USB Controller isn't working with it. You can add your own key mappings to the d3dx.ini file. Comments and examples are in the d3dx.ini file. You can specify any XBox button, or any keyboard button. If your controller is something really weird, you can have it generate keystrokes that are remapped. As long as it can generate something off the normal virtual keycode list, it will work. sorry but where i need to put your texture? You can do this easily by editing the d3dx.ini file. Look in that file for the key bindings, and comment out the ones you don't want by adding as semi-colon as the first character on the line. Or change the actual key specified to something you prefer. Hello, thanks for all your effort, but there is this problem with 8k resolution and some buggy effects, 5k fix doesn't seem to work, anything else that could be done here? Looks like it supports 5K in the fix, so concentrate on getting that to work correctly first. Try to move back to a known good state, and then add in changes one at a time. Wouldn't hurt to go back to 1080p to be sure everything works correctly there first. Be sure to follow the instructions in the post. For 5K in particular, you have to change some ini settings. Did you do that? 1080p and 4k are working great. I've set y7 to 5 in ini, also tried some other random numbers, no luck so far, still glitching, even in the first cutscene.